Well, after a few indulgent dinners last week in Atlanta and those cookies I brought you on Monday, I figured it’s time to pay the piper and eat some salad. Actually, I’ve been doing pretty good eating well and I’m enjoying it. Instead of eating a plate of cookies, I allow myself one a day. When I need another snack, I’m pretty into eating apples and pears lately. But salad? Not so much. 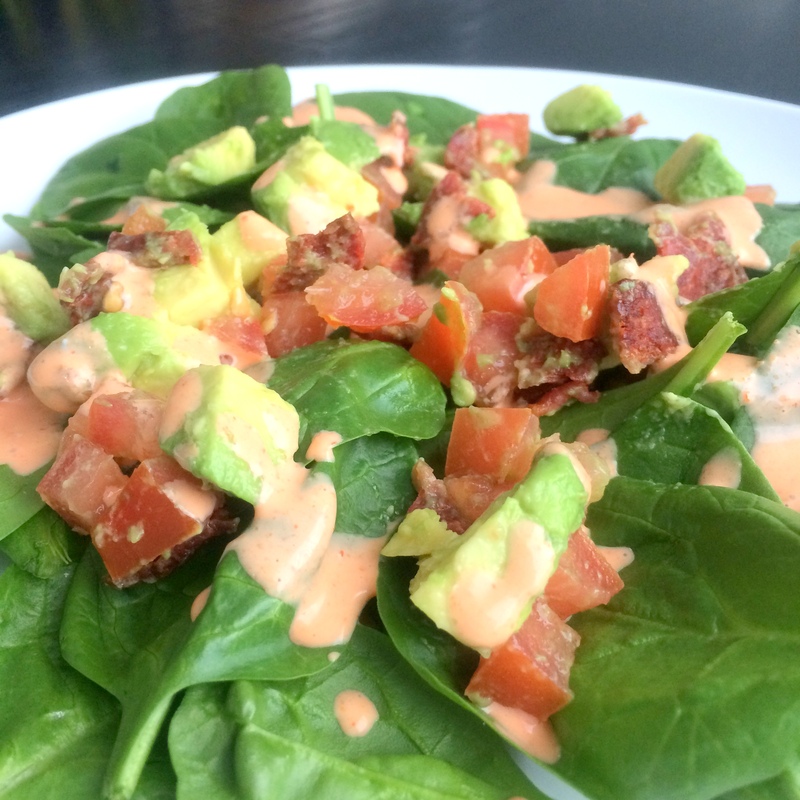 Sure, I should probably have a salad loaded with carrots and broccoli and peppers but this Sriracha BLT Avocado Salad not only looks good but is also healthy and has tons of happy flavor. 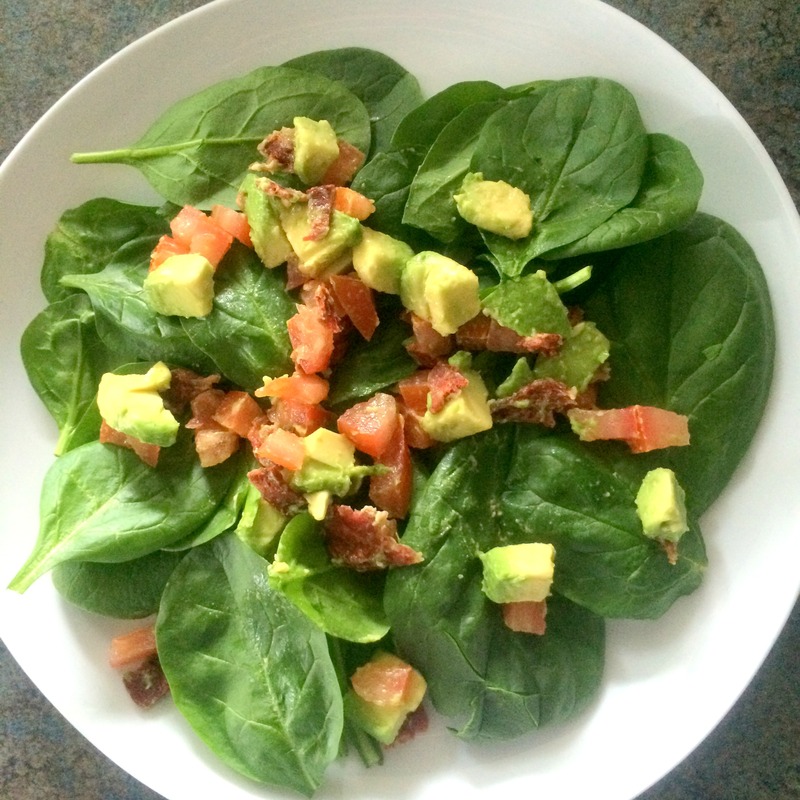 Chopped tomatoes and avocado are mixed with crunchy bacon (I used turkey bacon) and laid over baby spinach. A spicy dressing of sriracha, a little bit of mayonnaise and lemon juice is drizzled over the top, packing a punch. 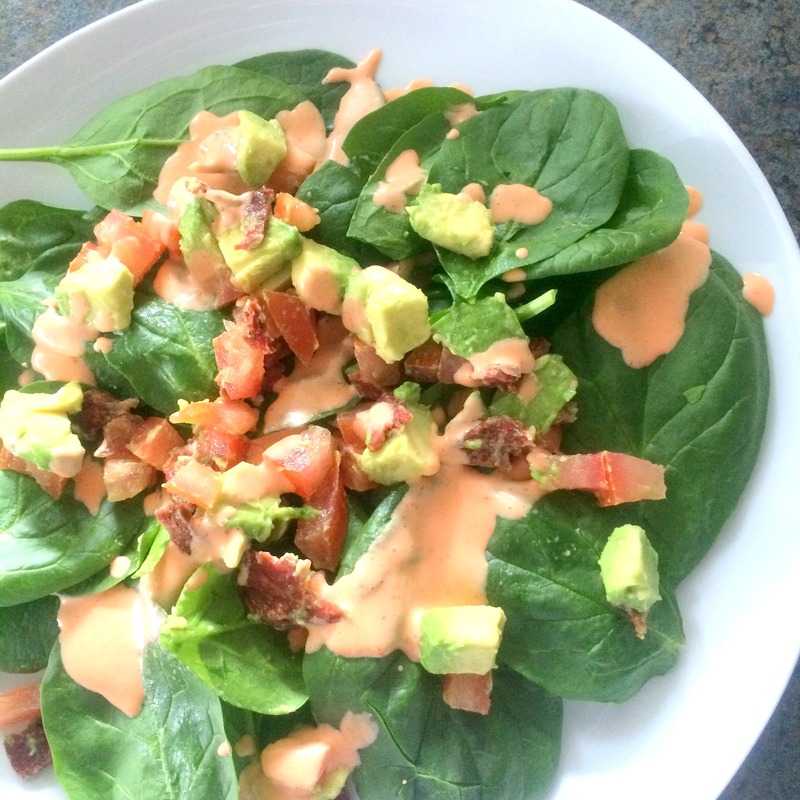 The creamy coolness of the avocado pairs perfectly with the sriracha dressing, the bacon adds flavorful crunch and the spinach gives a lot more nutritional value than iceberg lettuce which is typically in BLTs. This salad may not be loaded with veggies but it’s still low-calorie while not being low in flavor. Isn’t that the point of a salad? Being healthy and flavorful? Now this is a salad I can get behind! Combine onion, mayonnaise, Sriracha, and lemon juice in a small bowl; stir with a whisk. 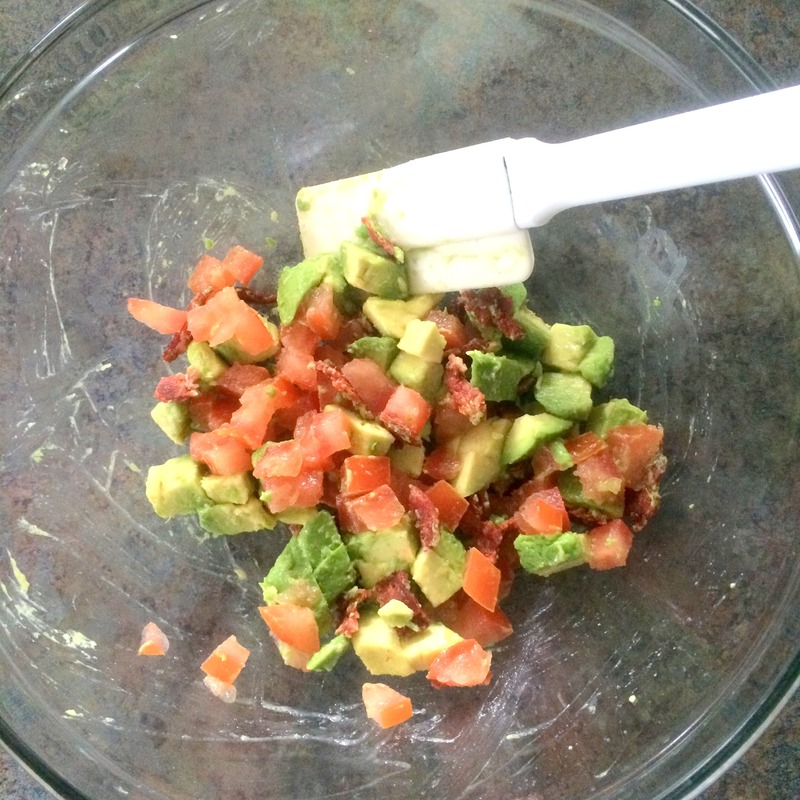 Combine tomato, avocado, and bacon in a medium bowl; toss to combine. Divide spinach among 4 plates; top evenly with avocado mixture. 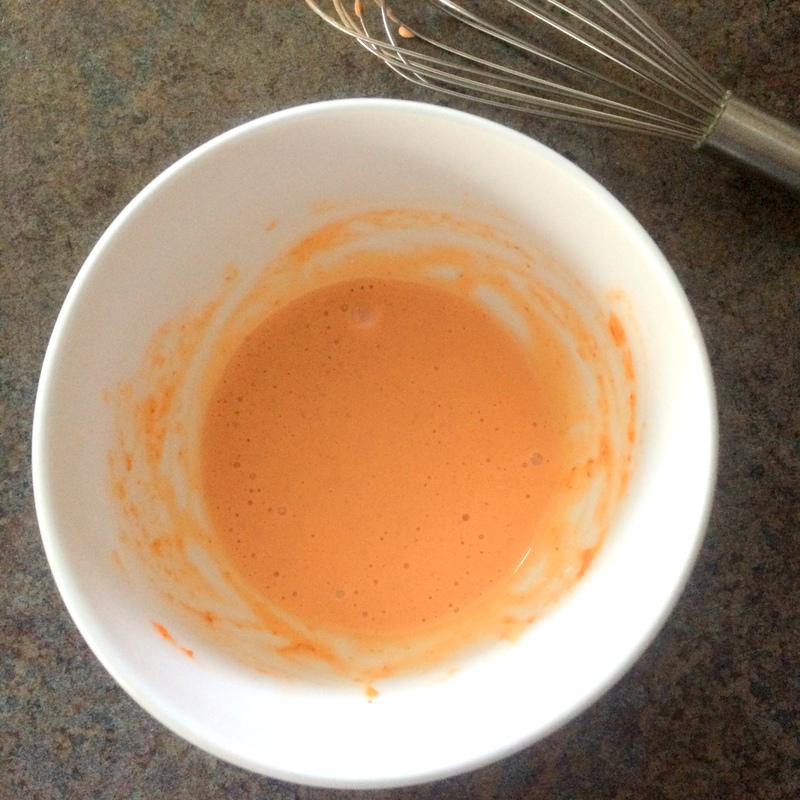 Drizzle with Sriracha mayo; sprinkle with pepper. Yummm. BLTs are amazing, but with Sriracha added, they’re even better! !